My friend who doing his PhD study at Johns Hopkins just send me the link about a SR paper of plagiarism. 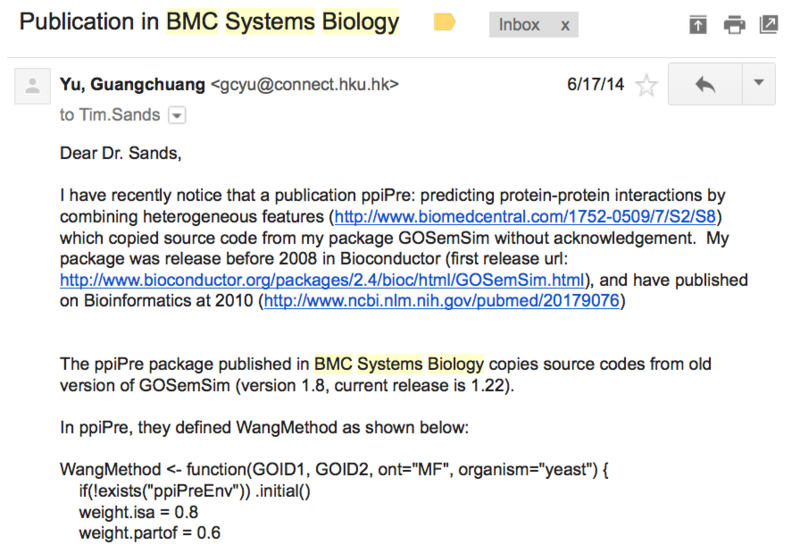 I have very similar experence of a paper published on BMC Systems Biology, which plagiarized my work and the editor just decided to publish an erratum. Deng etc. 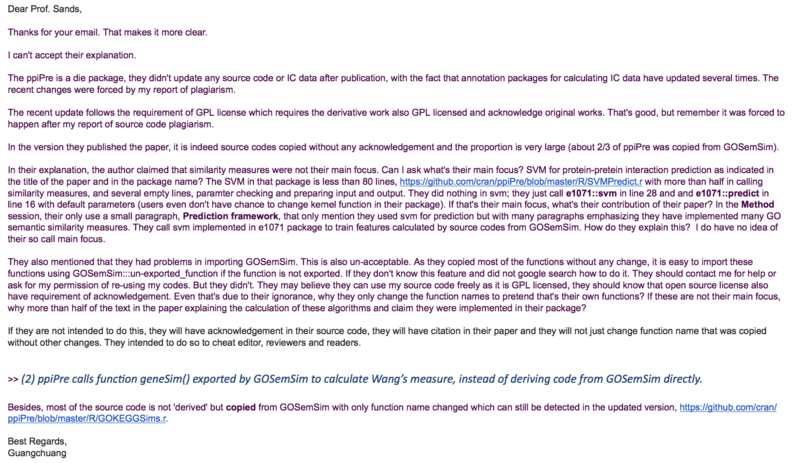 published an R package, ppiPre, that copied source code of my package, GOSemSim, and pretended that they developed these algorithms by themselves in their paper. 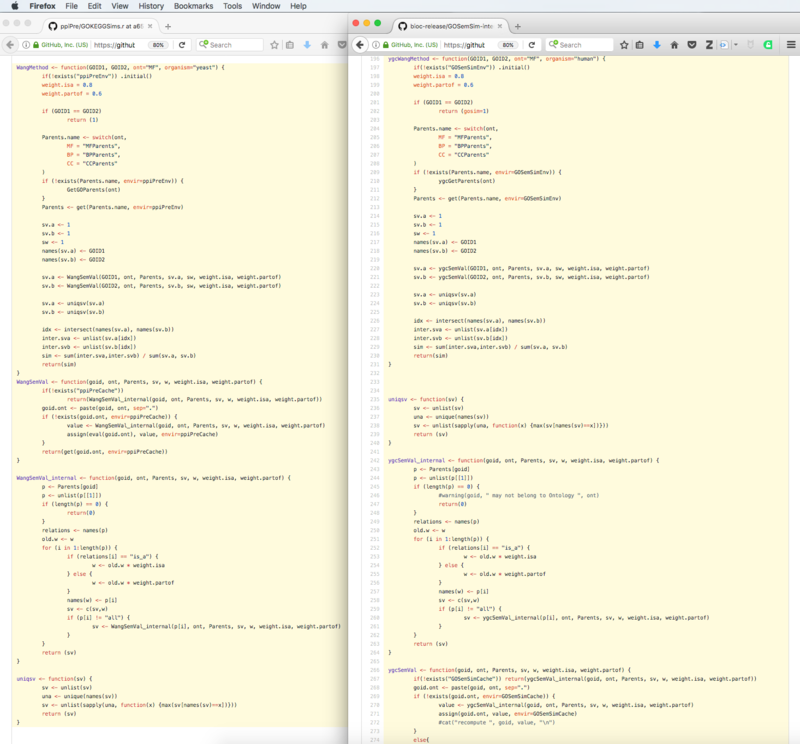 Here is the screenshot of the source code (left: ppiPre, right: GOSemSim). You can find out more on my blog post. As a developer of several open source software, I am glad that someone find my source code useful and happy if someone use my source code to make something better. But I am not happy if someone copies my source code by removing author information and changing function names to pretend the code was developed by himself. The situation is even worse in academic. Taking someone else’s works and passing it off as one’s own is definitely plagiarism and not allow in academic. He told me that they “do take cases of plagiarism very seriously”. 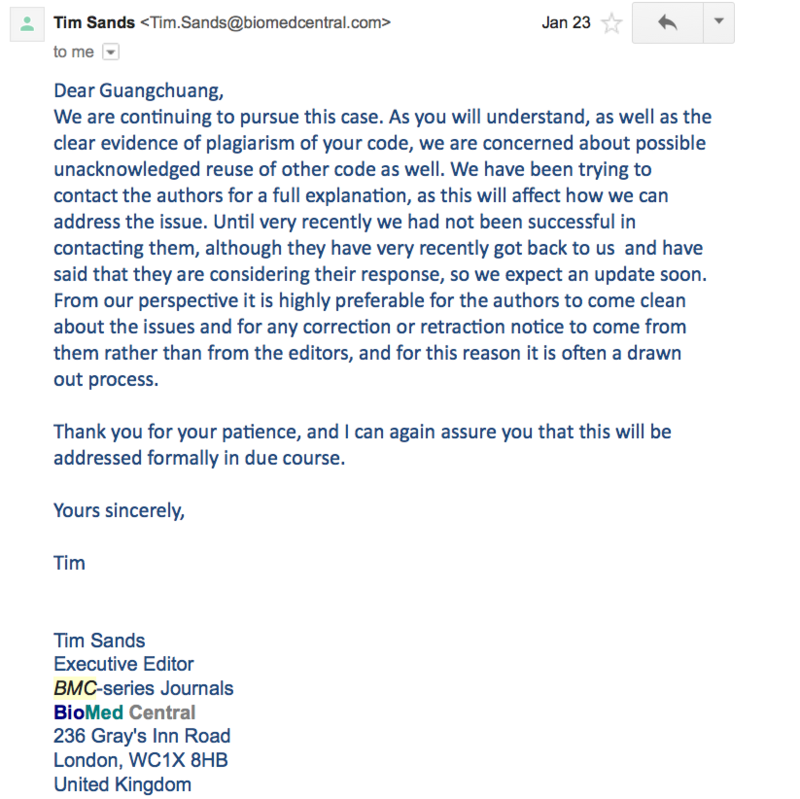 I don’t know how long their “due course” is and waited for the editor’s reply for 5 months without receiving any updated information. I then contacted CRAN for the issue of the ppiPre that copied source code without acknowledgement and the package was removed from CRAN at that time. After that I sent another email to the editor to ask for update. In the passed 5 months, they never even contacted the authors. I waited for 2 more months and also didn’t receive any information. I sent them email to complain that they are ruining the reputation of their journal. At this time, the editor told me he had contacted the author and we can “expect an update soon”. I waited for another 3 months and as usual without any update received. I sent another email to ask for update. Ignorance of the law is no defence, for otherwise anyone can choose not to know the law and have a defence in committing an offence. The same applies to plagiarism. Ignorance of GPL license is also not an defence of publishing someone else’s work in a scientific journal to claim that they did it themselves. AND AGAIN, the editor just disappear. I sent emails several times to several editors and they just ignore my emails. I never know how they interact with the editors. It was totally a black box for me as I never receive any email from both sides after the email above. They did not keep me updated. Even after they decided to publish an erratum, they didn’t notify me of their decision. The authors wish to acknowledge that the software package associated with our Research Article , under the name ‘ppiPre’, re-used software code for some of its functions from an existing software package, GOSemSim , without proper attribution and in breach of the software’s licencing terms. Additionally we neglected to cite the article by Yu et al. describing the GoSemSim software. The software code from GoSemSim  is used in the implementation of two GO semantic similarity measures, TCSS and IntelliGO. ppiPre additionally implements a KEGG-based similarity measure and three topological similarity measures, and integrates features with a support vector machine. We have now updated our software package such that it is licensed under a compatible GPL version 2 licence, and revised the package to give the appropriate attribution. We apologize for any inconvenience this oversight may have caused. They just “re-used” source code “without proper attribution” and these source code “is used in the implementation of two GO semantic similarity measures”. It seems that they implemented these methods themselves. 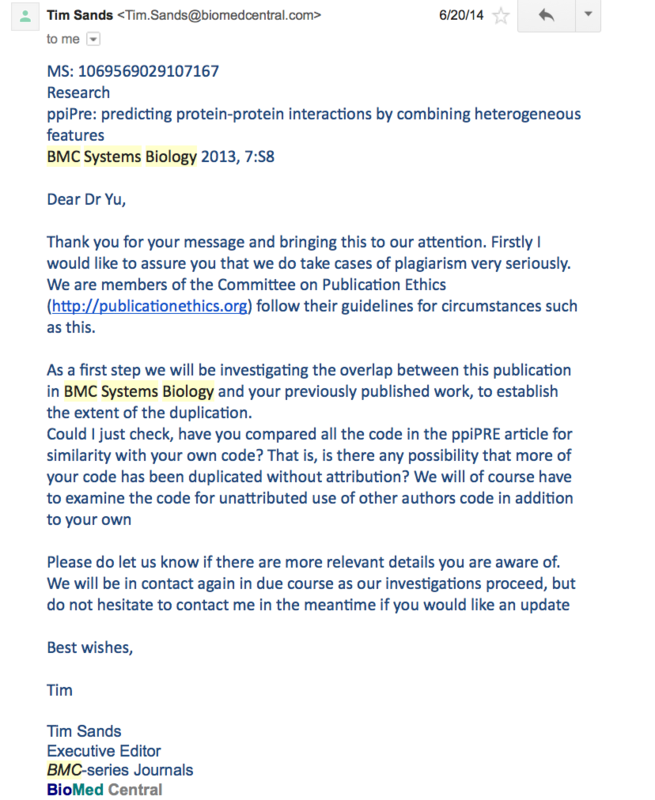 Of course the paper is not only an issue of source code plagiarism, but also an issue of publication ethics. 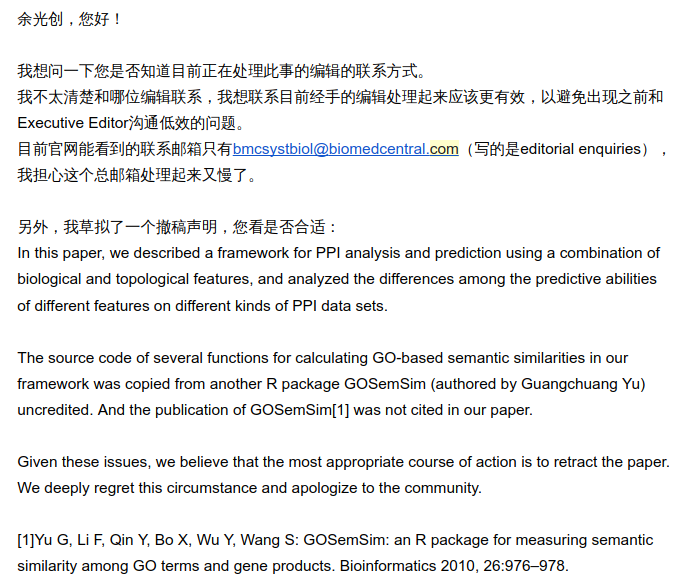 The ppiPre paper intended to introduce my implementation of GO semantic similarity measurement as their own to cheat reviewers and readers. 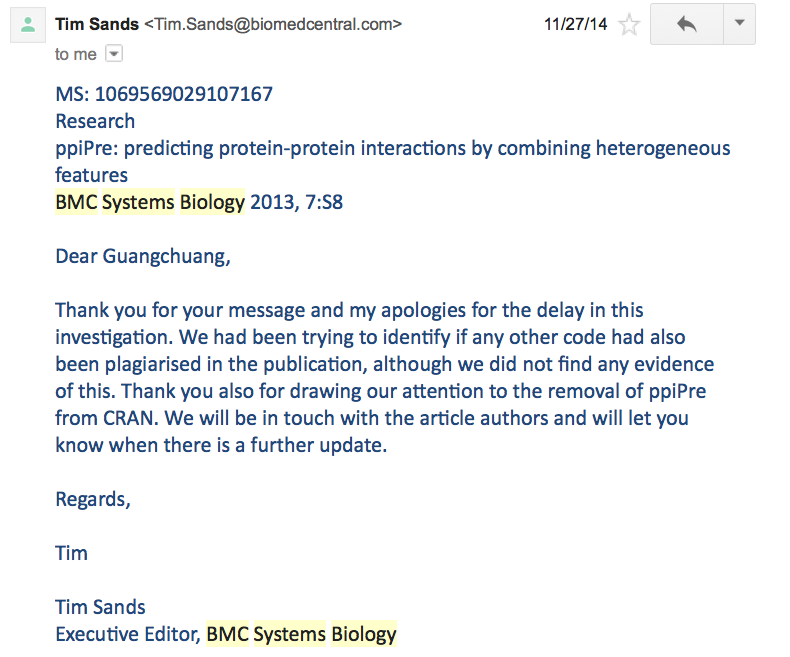 They did not say a word about publication ethics and the editors also ignore such issue. 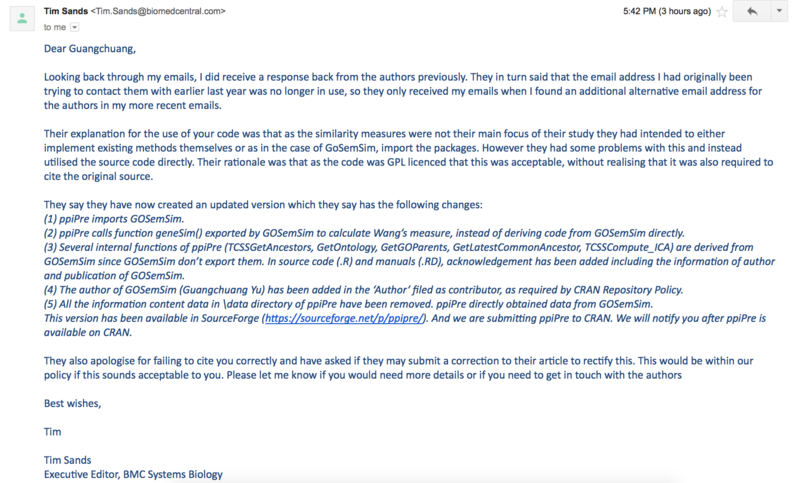 The case is very clear that they copied my source code and intended to pretend that’s their original work and use it to publish a paper. That’s definitely plagiarism. I am very disappointed! The editors are protecting paper of plagiarism and encouraging people to steal other’s work and publish on BMC.